"Cartoons and Humorous Illustrations are the most read and remembered part of a Publication or presentation. They attract attention, increase the visual and (most of the time) are just plain fun!" Go here for background information and qualifications of Jack Cassady. Enjoy the "JFF" Gallery showcasing ToonMaker's amusing images and cartoon art samples by Jack. So many requests for information about how to learn cartooning have been received that a special opportunity to study various levels of cartooning with Jack has been created through distance learning. Go here to order ToonMaker cartoon related items and services, such as the weekly internet feature "Monday Funnies", books, original cartoon art, DVD's, apparel and more. 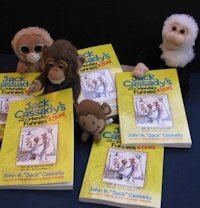 Go here for answers to frequently asked questions, news about Jack and ToonMaker.com and cartoon related links for your internet viewing pleasure. 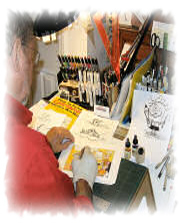 Go here to contact Jack with your questions about cartooning and ToonMaker products and services.